by BoxingBet.pl – Questions & answers with Manuel Charr (21-0, 11 KO), a challenger for the WBC heavyweight title. 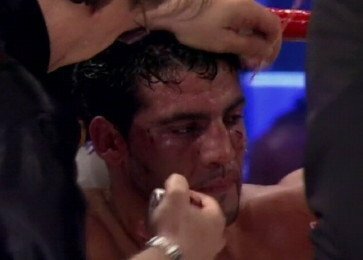 The Lebanon-born Charr, nicknamed “Diamond Boy” will face Vitali Klitschko (44-2, 40 KO) on Saturday in Moscow, Russia. Q: Hello Manuel, please tell us something about you history, your family and origin. How did you get to Germany? A: My father was a Syrian citizen but I was born and raised in Lebanon. Sadly my father died in 1986 during the war. We have lived in Beirut till we came over as fugitives to Germany in 1989. We, that have been my mother, my 5 sisters, my 2 brothers and I. I was just 6 years old. First we stayed for a couple of weeks in Berlin Wedding and then we moved to Katernberg (a district of Essen) next to Gelsenkirchen, in the center of Germany. There I grow up, went to school and learned German. Q: Do you visit Syria sometimes? A: I do have some family there, but me close family is in Germany, so I hardly go over there. Q: Do you have a big fan base in Syria? Boxing isn’t too popular in Arabic countries. A: I do. But you are right, boxing is not as popular as in Germany for example. Because of the circumstances no money is invested in the boxing at present. Hopefully that will change soon. Q: What decided that you became a boxer? A: I started really late. I was already 16 years old when I started with Thai Boxing. Back then I was inspired by a movie of Jean-Claude Van Damme. Q: What’s your motivation, what are you fighting for? A: Since I started boxing I want to become world champion one day; that is my motivation. I believe that if you have a dream, go for it, try hard, it is up to you to make your dreams come true. Q: What is the main Klitschko’s asset in your opinion? His experience, reach, height, power or something else? A: No doubt he is a great boxer and he is incredibly experienced. Q: How is your preparation going? German magazine Bild.de recently wrote, that you train in old building and you don’t have any professional boxing equipment. Is it true? A: I am in great shape. I am training hard – I exercise twice a day and usually take one day off per week. The story is true, I have no boxing stable behind me and so I rented a small warehouse in Cologne. I abandoned my possession, organized some training stuff and now I am exercising there and it feels right for me. It sometimes reminds me of the first Rocky movie, he started with almost nothing but made the best of what he had on hand. I invested all my money to make my dream come true to become the heavyweight champion of the world. Q: In the past you were promoted by Universum then you moved to Felix Sturm company. Now you don’t have any promoter. What happened? A: Let’s put it this way, … I have made my experience and decided it is time for me to make it on my own. Q: How is the situation with your trainer now? A: I have a great trainer team around me. Clive Salz – a conditioning coach icon. Valeri Belov – former Russian national coach and former Povetkin’s coach. Vardan Zakarjan – multiple German Champion and Olympian. They are great and I am happy to work together with them. Q: Maybe it would be better to leave Germany and try your luck in USA? A: Right now I am happy in Germany – I grow up here, my family and friends are here, this is the place where I want to be! Q: Can you reveal how much money you will earn for the fight with Vitali Klitschko? A: Not as much as most people think and certainly not as much as I would like to, but if I win it will be enough to buy my mum that brand new fitted kitchen she always wanted. Q: You came to the press conference after Haye-Chisora fight. David Haye didn’t recognize you at the beginning. Were you surprised by that? A: Now he knows who I am (laughing). Q: In the past you also came to the press conference in Germany and you threw down a challenge Vitali Klitschko. Do you believe that appearance helped you to get a chance to face Vitali? A: I am sure it helped but it was not the decisive factor. Q: What is your gameplan for the fight with Klitschko? A: I don’t want to go into details, just 3 words: volition, power and the heart of a fighter! Previous boxing news: What Must Julio Cesar Chavez, Jr. Do To Beat Sergio Martinez?